How to make the game "monopoly"
How to make a game "field of miracles"
Board games are a great way to spend time with friends and family. Almost in each company, whose members often play Board games, have their own house rules - the so-called "homeros", formed their own preferences - long or short games, strategy, "." or puzzle games, etc. And sooner or later someone comes up with the idea to create a Board game that would suit his company. How to make Board game "Monopoly"
Colored pens, paper, pencils, computer and printer. Decide the genre: strategy, tactical "combat system", role-playing, card game, hodilka-brodilka, logical like checkers or another. There are games on the junction of genres. Chosen direction napasai depend on the setting and more about the mechanics of the game. The setting is the world in which to place your adventure. Their quantity is limited only by your imagination. Fantasy worlds, outer space, the prehistoric era, the distant future with cyborgs and lasers, Wild West, Ancient Greece, Mars... But not enough to figure out the world - you need to make your world was not internally inconsistent. Not stopping to think of its history and laws. For each setting and for each genre needs its own game mechanics. Heart role-playing - role-playing system, economic strategy - ways to win, and events of a collectible card game - the order of moves, the rules of rotation and/or removing and putting some maps, tactical combat game characters and order of damage, etc. Consider the rules. They are usually "tied" to the mechanics, will represent the principles of interaction between the players, the laws of the world and the system of tunnels. Consider how to change the rules. Take manufacturing layout of the game. It includes: a game field, chips, cards, dice. All of this can be drawn freehand and cut out. But if you want to offer your game to the publisher, it is better to draw on the computer. You can use it for making games "classic" editors, Word or Photoshop, the harder InDesign, or take advantage of special programs for layout of Board games, for example, DangeonPainter. Swipe beta testing. First it is advisable to spend alone, to resolve the obvious "shoals". Then you can gather with friends or family. It is desirable that they already had the experience of playing Board games, otherwise they may not like. And your game may not be so bad. The final "finishing" games. Consider the experience of playing with the "focus-group". Remove all the distortions in mechanics, stabilizethe economy, adjust the power of lasers, Periquita swords into plowshares, put orcs and elves in different types of armor, take away the aliens axes and hand them blasters, and ahead to new adventures! If the game was a great success, can try to offer it to publishers. 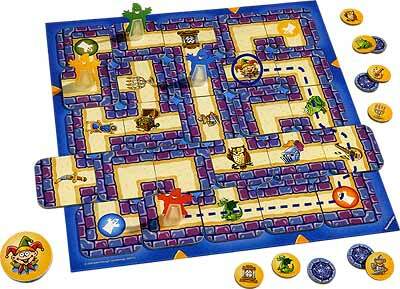 Many manufacturers of Board games are looking for talented authors. Good luck and inspiration!